Today, I was in so much pain. Much, much more pain than the usual. About an hour ago, I couldn't stand the pain so much and I had to be taken to the clinic. On top of my physical pains, throughout the day my eyes were turning red, continuously watery and tears were coming out of my eyes and it was stinging and painful all at the same time. After going to see the doctor he confirmed that I have conjunctivitis (eye infection). I've actually suffered from conjunctivitis earlier this year and it was just as bad as this one, if not worse. My eyes starting swelling that I couldn't even recognise myself anymore. Obviously in this situation I can't wear my contacts and added to that my glasses broke a few days ago so I cant see clearly. It hurts every time I open my eye, close it or even when there’s light. It's not easy for your eyesight to be blurry when you're also immobile and depend on crutches to move about and it came with migraine and a headache too. I became even dizzier and the migraine is just, gaaaahhhh! This happened just while I was recovering from the events this past weekend, one for work last Saturday which I had already planned to share more of today before I woke up with this illness, and then on Sunday I went for a family tahlil event. In my current condition, attending just one event is already considered to be an achievement and attending two events in two days is considered super hectic for me. No joking. I need a few days and some times even a week to recover from going out just once or twice. A friend asked me how am I earlier today and I was just saying how grateful I am that my condition has improved recently as I have a lesser need for the wheelchair and now I can use the crutches to move about and personally I feel that is good progress for me and things seem a little brighter these days. Alhamdulillah. So in terms of mobility my condition is improving. However, when my conjunctivitis came together with my migraine, I couldn't move a lot. My body felt so heavy the whole day. I woke up but I couldn't get my body to sit up. Even going to the washroom from my bed was a struggle just when I thought my body was getting better. On top of that my right eye was so red and stinging with pain, it was hard to open it and tears kept coming out from my right eye, (even though I wasn't crying), I knew I had to get this treated to. So I had to go see the doctor because that's what we do when we realise something is wrong and it isn't something that will go away on its own. Khubayb @kneok had to push the wheelchair from my room to the car to bring me to the doctor. My whole body was in even more pain. The doctor gave me more meds, on top of all the meds that I have been taking daily the past few months. On the way back home from meeting the doctor, I did the questioning again: WHY? What is the reason this is happening to me? I know this is a test from Allah but what is the reason its happening to me? Again? Is it a sign that I’m doing something wrong? Or is it a sign I'm doing something right? What does it mean? Is He giving me a sign because even though I was already sick and immobile these past few months, I really just had a good weekend. It was a good event and last Saturday was a really happy day for me. Why is it when something good happens it lasts just for a while, and then suddenly I have a new illness again? Sometimes my thoughts are internal and I've become really good at bottling things up especially my feelings and thoughts since I was little but this time I was talking out loud and Khubayb was just listening while I was questioning my fate and feeling sorry for myself. He didn't say anything at all. He just let me express my frustrations. When we reached home, he took the wheelchair out, helped me out of the car and sit on the wheelchair, passed me my handbag and my phone, and dropped me at our house’s entrance while he went to park the car. I was wearing sunnies even though it was night time coz I couldn't stand the lights and I was in so much pain so I closed my eyes. Even though I was sitting on a wheelchair, my head was spinning, my back hurt, and my knees, my ankle, my shoulders and the rest of my body. I closed both eyes feeling just so, so weak. I didn't know what to do anymore and then I started to read Surah Al-Fatihah silently for myself, trying to ease the pain while I was waiting for Khubayb to park the car. An Ustaz recently reminded me that one of the things that I should do is to give myself the gift of reading Al-Fatihah for myself because if we don't no one else might do it for us. So even more so when we feel helpless, we should really turn to Him and start to read Surah Al-Fatihah for ourselves first, and then we read it secretly to others too. After I read it, I opened my left eye to look at my phone that Khubayb passed to me. The first thing I saw was a a notification from a friend of mine whom I've known since my humanitarian mission trip to India, brother Saiem. I knew he is in Makkah at the moment so I opened the message and there it was. This photo. 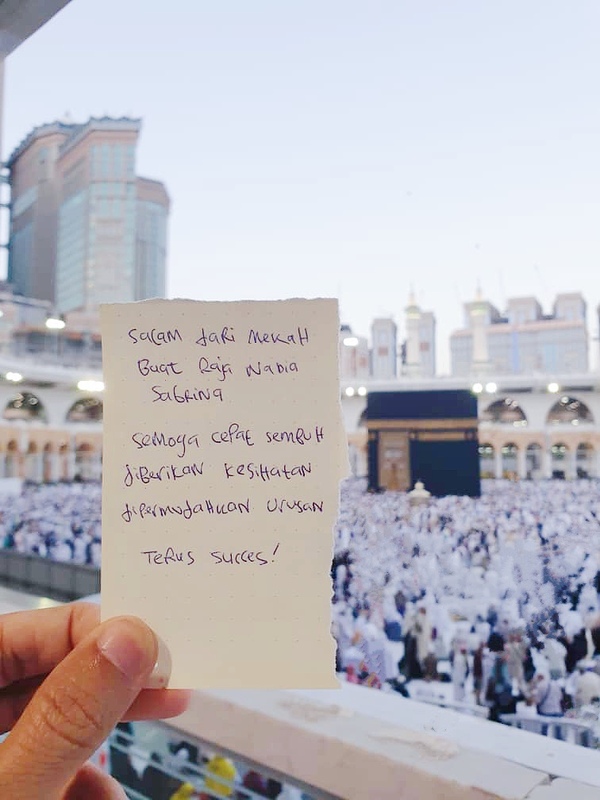 A photo of a prayer/dua for me in front of the Kaabah. I was stunned. Surprised. Shocked. The frustrations I had and felt suddenly and instantly did not make sense and disappeared. In the midst of me questioning why this and why that, that if all these illnesses are a sign, then what are these signs trying to tell me, what is the message and the reasoning behind the tests, He, Allah SWT, the Almighty, the Most Loving and the Most Merciful sent this instant message through Saiem. A photo of the kaabah with a prayer, a du'a for my health and wellbeing. It is like He’s asking me to not lose hope and keep on praying, He is telling me when you feel helpless just turn to Him. His reminders or signs are like medicine in itself. He creates sicknesses and illnesses but He is also the only One who cures, though there are a lot of methods or tools to help us heal and recover in this world. His instant sign and message answered my questions, my complaints, my cries and my prayers. Literally the moment I questioned my tests, I received this photo. 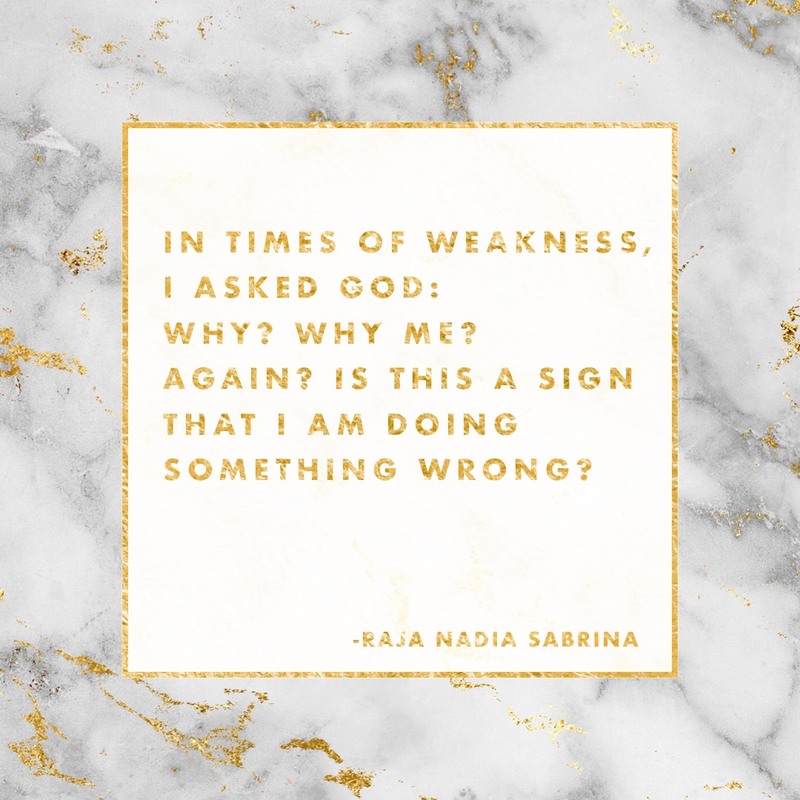 A sign and a reminder to myself. When the events of today happened, a voice in my head reminded me that this has actually happened before very recently and I shouldn't be questioning my fate. But in so much pain, I ignored that voice and I forgot myself. Until I saw this photo. It's like a slap. The good kind. And then, I stopped questioning. Ya Allah, forgive me. For questioning what you have determined for me. I've asked you to determine what's best for me but even when YOU have done so, I forgot my resolve and determination. This reminds me of the story of Prophet Musa and Khidr in Surah Al-Kahf. Huhu. Forgive me. 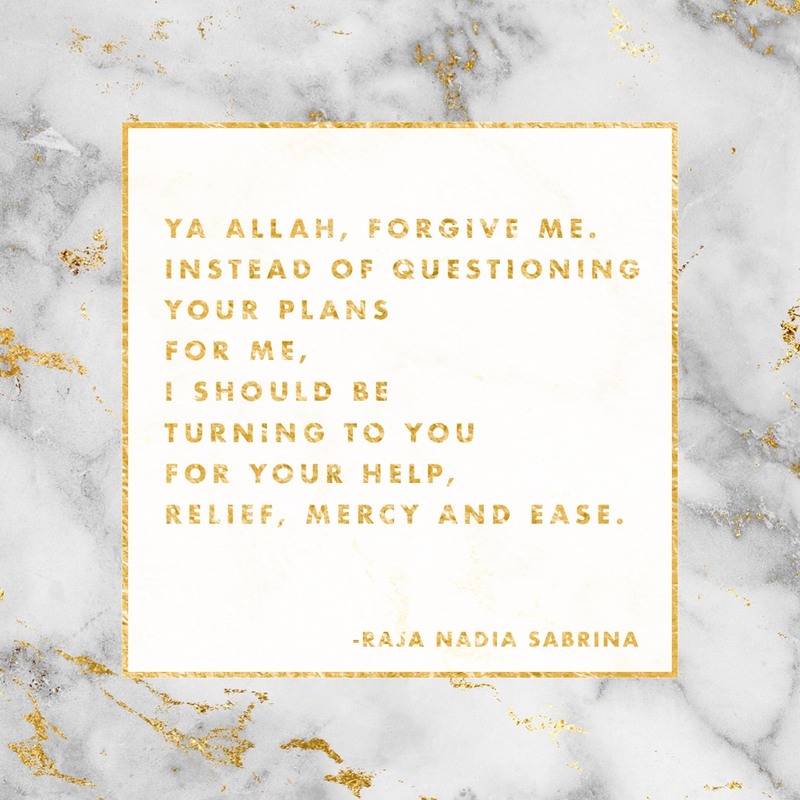 Instead of questioning I should be turning to you, asking you for help, trust you, have faith, complaining only to you and keep on praying for relief, mercy and ease instead of questioning why and what You have sent to me. May we all be forgiven if we ever have times like this and may we always get instant reminders from our Creator like this if this happens again. This post was written on my phone on Monday but I only recovered enough to get up and transfer this from my phone and post this on my computer today. Alhamdulillah my eyes are slightly better now. See, all things are temporary insyaAllah. Good things, bad things, nothing is permanent. InsyaAllah.